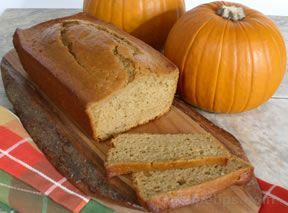 A sweet cinnamon treat to enjoy after carving your Halloween pumpkin. Save all those seeds for this special treat. When cleaning out a pumpkin for carving, save the seeds from the pulp you remove. 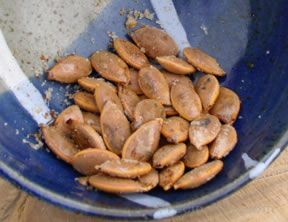 It is OK to leave a little of the pulp on the seeds. Do not was the seeds because the pulp will add a little flavor. Preheat the oven to 300 degrees F. Spread the canola oil on a baking sheet. Spread the seeds on the baking sheet in a single layer and sprinkle with kosher salt. Melt the butter and mix with the cinnamon and sugar; sprinkle over the seeds and toss to evenly coat. Place in the preheated oven for 45 to 60 minutes or until the seeds are golden. Spread out on wax paper and allow to cool. "We carved pumpkins this weekend and saved the seeds to roast. We made some just plain but then we tried this cinnamon and sugar recipe for something different. 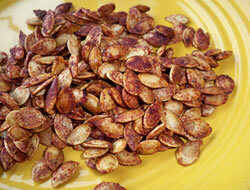 I love cinnamon and sugar so I thought these pumpkin seeds were great. The kids liked them too but they also like them just roasted with kosher salt."